NCERT Solutions for Class 10 English Chapter 13 The Dear Departed are provided here with simple step-by-step explanations. These solutions for The Dear Departed are extremely popular among class 10 students for English The Dear Departed Solutions come handy for quickly completing your homework and preparing for exams. All questions and answers from the NCERT Book of class 10 English Chapter 13 are provided here for you for free. You will also love the ad-free experience on Meritnation’s NCERT Solutions. All NCERT Solutions for class 10 English are prepared by experts and are 100% accurate. 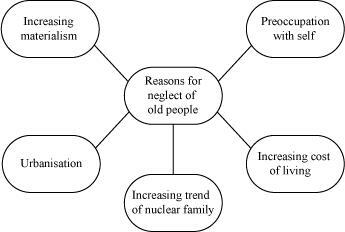 What are the problems faced by the old people as a result? 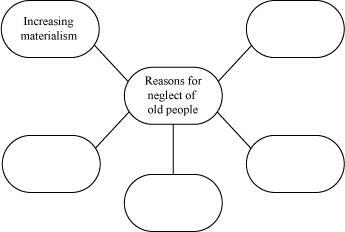 What are the reasons for the old people being "abused, harassed and abandoned" in India? The old people feel very lonely and ignored. They often feel depressed. They feel that they have nobody to care for them. They cannot share their problems with anybody. Lives in metropolitan cities have left no time with members of the family to spend with each other. Given below are the main incidents in the play. They are in a jumbled order. Arrange them in the sequence in which they occur in the play. 1. Victoria is asked to fetch the bunch of keys to the bureau to look for the insurance receipt. 2. Mrs. Slater instructs Victoria to put her white frock on with a black sash. 3. Mrs Slater discovers that grandfather is 'dead'. 4. The Slaters fetch the bureau and the clock from upstairs. 5. The family sits down to have tea. 7. Grandfather comes to know how his daughters were in a hurry to divide his things between them. 8. Grandfather announces his intention to change his will and to marry Mrs. Shorrocks. 9. Grandfather comes down and is surprised to find the Jordans. 10. They discuss the obituary announcement in the papers and the insurance premium payment. 11. The Jordans arrive and learn the details of grandfather's 'demise'from the Slaters. What is the reason for the Jordans taking a long time to get to the house of the Slaters? What does it show about the two sisters' attitude towards each other? The Jordans were late because they bought proper mourning dresses to wear before they came to Slater’s house. Both the sisters were competing against each other and trying to be one up the other. Mrs. Slater thought that her sister wouldn’t have thought of mourning clothes, meanwhile Mrs. Jordan had already bought readymade clothes for mourning. Rather than being concerned about the death in the family, both sisters were worried about their appearances and how they could outdo each other. How does Mrs. Slater plan to outshine the Jordans? What does it reveal about her character? Mrs. Slater was not very happy with the mourning dresses that she and her family were wearing. In fact, she had ordered new dresses for everybody. However, she thought that her sister wouldn’t have thought of mourning dresses and so she would outshine them there. Mrs. Slater was a very superficial person. She was not concerned about the death in her family but was more bothered about her appearance and how to be better than her sister. Why does Mrs. Slater decide to shift the bureau from grandfather's room before the arrival of the Jordans? How does Henry react to the suggestion? Mrs. Slater always liked grandfather’s bureau. After his death, she decided to shift it to sitting room before her sister arrived lest she laid a claim on it. Henry was shocked at the suggestion because he felt that the sisters should amicably divide grandfather’s things. He also felt that it was too heavy and moreover, he was worried about the arrival of the Jordans while they were shifting it. What does Mrs. Jordan describe as 'a fatal mistake'? What is the irony in the comment she makes on Mrs. Slater's defense? Mrs. Slater sends for Dr Pringle as soon as she realises that grandfather is dead. However, Dr Pringle could not come as he was out. It was this that Mrs. Jordan describes as a “fatal mistake”. According to Mrs. Jordan grandfather could have been revived had Mrs. Slater sent for another doctor. It is this blunder on Mrs. Slater’s part that Mrs. Jordan describes as fatal. Ben appreciates grandfather saying 'its' a good thing he did'. Later he calls him a 'drunken old beggar'. Why does he change his opinion about grandfather? Ben appreciated grandfather when he came to know that he had gone out to pay his insurance premium. However, when he got to know that he had not paid the premium instead gone to a public house, he calls him a drunken old beggar. Ben changed his opinion about grandfather when he realised that he hadn’t paid premium because now after his death they could not claim the insurance money. What change does grandfather make in his new will? What effect does it have on his daughters? Grandfather decided that in his new will, he would leave all his money and things to the person he would be living with when he died. This led to another spat between the daughters. Since both of them were very keen to get his money and things, they wanted that he should stay with them. What are the three things that grandfather plans to do on Monday next? The three things that grandfather planned to do on Monday next was first to go to a lawyer and change his will, then pay his insurance premium and finally go to St. Phillip’s church and get married. Bring out the irony in the title of the play. The play is aptly titled Dear Departed: the departed in this play was truly dear to his daughters and sons-in-law. While they did not anxiously wait for his, they exactly did not regret his sudden passing away. Mrs. Slater immediately assumed that the grandfather was dead. She, without delay, sent a message to her sister. She arranged for tea for her. She quickly brought down the bureau from the grandfather’s room so that her sister could not claim it. The sister and brother-in law arrived late as they could not come without proper mourning clothes. They chose to have tea first rather than pay their respect to the departed soul. They cursed him for not having paid the insurance premium. When they realised that grandfather was alive and was going to alter his will, they quarrelled in front of him. Thus, the departed was dear as long as he left his wealth to them. How does the spat between his daughters lead to grandfather discovering the truth? The spat happened when Mr. and Mrs. Jordan asked grandfather on whether he remembered anything while sleeping. Mrs. Slater, however, prevented Mrs. Jordan from coaxing grandfather. In fact, Mrs. Slater was scared that he would remember that she and Mr. Slater had shifted the bureau and the clock from his room. Mrs. Slater’s worst fears came true when grandfather realised that the bureau and clock was shifted to the sitting room. This led to a full fledged verbal exchange between the two sisters. Mrs. Jordan told the grandfather that Mr. and Mrs. Slater shifted the bureau and the clock from his room to the sitting room because they thought he was dead and they were shifting things out of his room so she couldn’t lay a claim on them. After discovering the truth, grandfather became very bitter because he felt that his daughters didn’t even wait for his funeral to start dividing things between them. Compare and contrast Henry's character with that of his wife. Support your answer with evidence from they play. Henry was a simple man who followed all his wife’s instructions. She asks him to wear grandfather’s slippers; he wears them even if they are a size smaller to him. Unlike his wife, he is attached to the grandfather: he is not very happy with his wife shifting the bureau and the clock from his room. He felt that the sister should amicably divide things between them. He wished that grandfather’s obituary in the newspaper should be nice and poetic. He tried to stop the two sisters from quarrelling but failed miserably. Henry was a straightforward man unlike his wife who was a manipulative lady. She shifted grandfather’s bureau and clock from his room before her sister arrived so that she could not lay a claim on it. She made her husband shift the bureau in spite of his reluctance. She misbehaved with her sister when she accused her of robbing grandfather of his things in spite of the fact that she was guilty of the same. She did not even wait for grandfather’s funeral before she started dividing things between them. "Are we pinching it before Aunt Elizabeth comes?" a) What does 'it' refer to here? b) How does Victoria conclude that her parents are 'pinching it'? c) Mention the two reasons that Mrs. Slater gives for her action. d) What does it reveal about the difference between the attitude of the elders and that of Vicky? a) “It” refers to the bureau that was grandfather’s room. b) When Victoria was told by her father that he and his mother were shifting the bureau downstairs, she concluded that her parents are “pinching it” because everything that was in grandfather’s room had to be equally divided amongst the two sisters. c) Mrs. Slater wanted the bureau for her husband Henry because he always liked it. Moreover, she felt it was okay to have this kind of mentality. d) The elders instead of mourning the death were busy dividing grandfather’s things. Victoria, on the other hand, had wisdom beyond her years. She immediately understood the meaning of their actions. She didnot like her parents shifting the bureau. What an eventful day it was!! First grandpa died then, he came back to life. We were on a roller coaster ride of emotions. The morning started as usual: grandpa was a little drunk when he went out to pay his insurance premium. He came back home and went straight to bed. When Mother went to check on him, she thought he had passed away. Aunt Elizabeth and Uncle Ben arrived shortly. There were minor arguments about who would be getting grandpa’s things. It was then when we realised that grandpa had not died but was in a deep slumber. In front of grandpa, the arguments turned into a full-fledged quarrel. Grandpa felt very bad. He decided to alter his will. Nobody was bothered for grandpa’s funeral. They were only concerned for his things. The whole day’s incident has left me very bitter. There is no respect for the dead but everybody is only concerned with the departed things. However, I am glad that grandpa is alive! Bye for now! Grandfather says, "It seems to me that neither of you has any cause to feel proud about the way you've treated me.'' While it is true that the daughters disregard modesty, decency and flial obligation, grandfather cannot be fully justified in practically disowning his family. Besides, Victoria loves him and he seems to have spared no thought for her feelings. Grandfather is very upset the way his children have behaved. It seems that they couldn’t wait for his funeral before dividing his things. In a fit of rage he decides to change his will. It is initial reaction to the scene that happens before him. If grandfather was so upset with his daughters, he should have willed his things and money to his grandchildren instead leaving it to a total stranger. His grandchildren are very fond of him and so is he of them. "I don't call that delicate, stepping into a dead man's shoes in such haste." a) Who makes this comment? b) What prompts the speaker to say this? c) Bring out the significance of this statement. a) Mrs. Jordan made this comment. b) When grandfather sees Henry wearing it, Mrs. Slater quickly gives them back to him. This prompts Mrs. Jordan to make this comment. c) Stepping into dead man’s shoe is to take the position of the dead man although one might not be capable of it. Mrs. Jordan on seeing her brother-in law wearing grandfather’s shoes feels that he was in too much of a hurry to step into the grandfather’s shoes. He didn’t even wait for his funeral. "Now, Amelia, you mustn't give way. We've all got to die some time or other. It might have been worse." a) Who is the speaker of these lines? b) What prompts the speaker to say these words? c) What does he mean when he says 'It might have been worse'? d) What does it reveal about the speaker's character? a) Mr. Jordan is the speaker of these lines. b) When Mr. Jordan sees Mrs. Slater crying, he tries to console her by saying these lines. c) Mr. Jordan means that it was okay if grandfather passed away, because he was old and he died peacefully. It would have been worse if any of them would have died because they are still young and have children to look after. d) Mr. Jordan seems to know how to present himself in such situations.